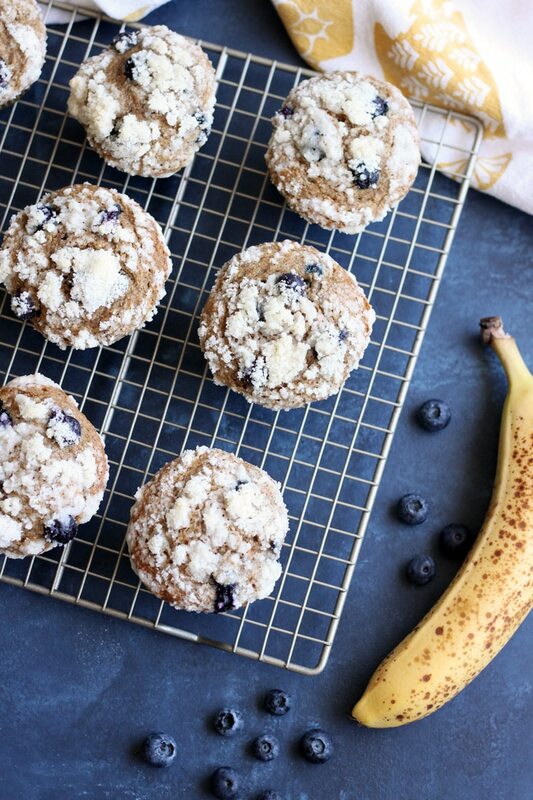 These Banana Blueberry Whole Wheat Muffins are packed with wholesome ingredients. They make a delicious breakfast that tastes like a decadent dessert. Summer is quickly coming to an end. 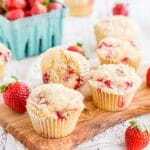 And what better way to savor the season with some late summer berries than baking up these banana blueberry whole wheat muffins! 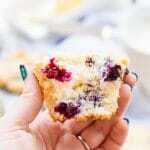 But don’t you worry, this recipe also works well with frozen blueberries if you can’t get your hands on a fresh batch. They may stain your batter a bit, but they will taste just as good. And you can enjoy them all year long. 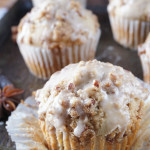 I love muffins for one great reason, they’re pretty much cupcakes without frosting. And it is completely acceptable to eat them for breakfast, that’s what they’re made for! Not only that, they are a portable and convenient for on-the-go breakfast. 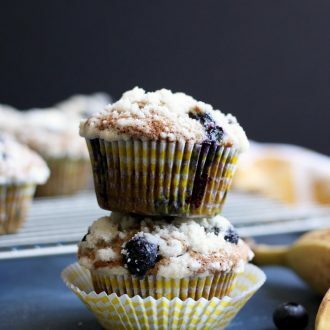 These banana blueberry whole wheat muffins are made with whole wheat flour, yogurt, coconut oil, and a touch of brown sugar. 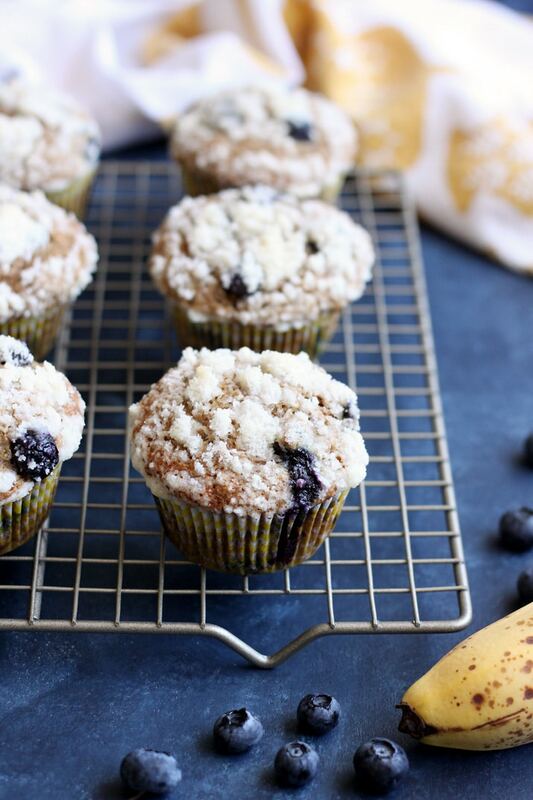 They’re packed with banana and bursting with blueberries. The crunchy streusel topping takes them over the top. However, if you want to stick to 100% whole grain, you can skip the streusel, although not recommended because streusel is awesome! I’ve been slightly obsessed with coconut oil. I know I’m probably way late on picking up this trendy ingredient. But after we came back from Maui, I bought coconut oil specifically to make these Tropical Pineapple Coconut Dog Treats for my fur babies. The coconut oil made it smell so amazing! I was determined to use it in a for-human-recipe. However, the stars of this recipe are the banana and the blueberries. 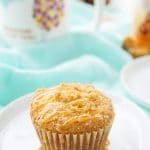 So if you don’t normally cook with coconut oil, you don’t have to run out and get a jar just for these muffins. You can substitute it with any other oil you prefer to cook with, in the same amount. Breakfast is the most important meal of the day. 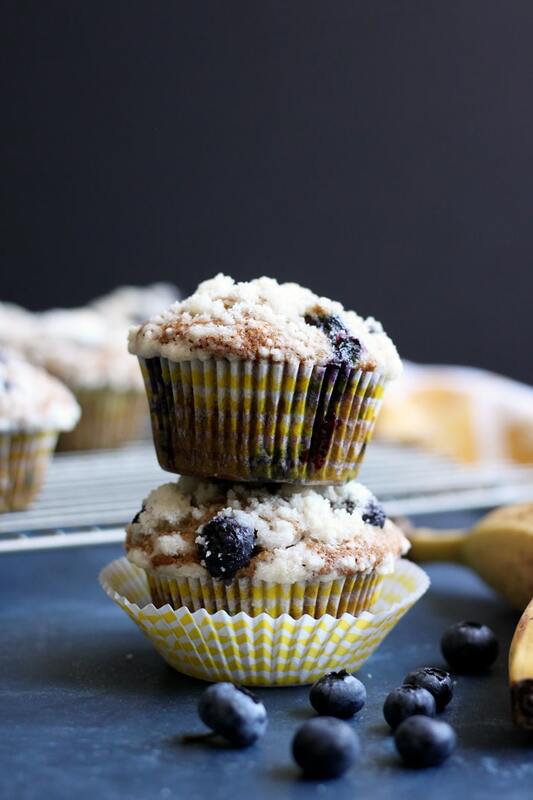 So if you’re bored of that plain oat meal or tired of that green smoothie you’ve been eating for weeks, make these banana blueberry whole wheat muffins and get back into the game! 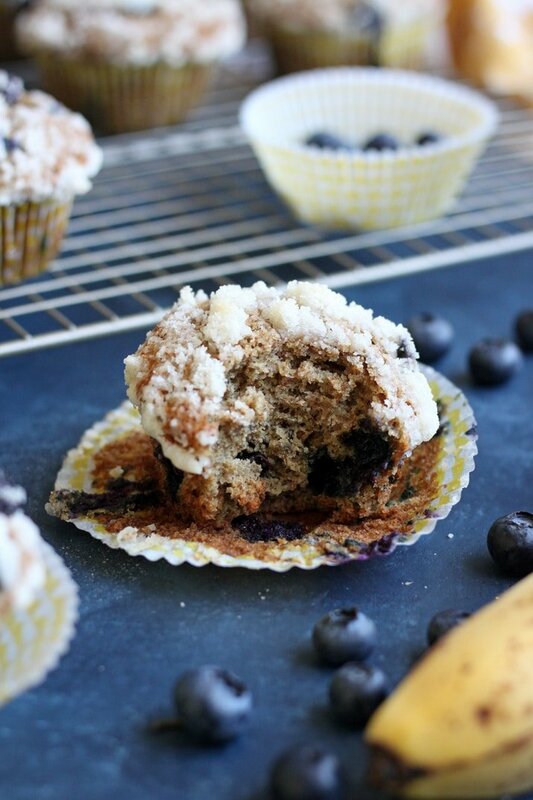 These Banana Blueberry Whole Wheat Muffins are packed with good for you ingredients. 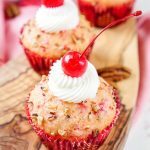 They will make a delicious breakfast that tastes like a decadent dessert. 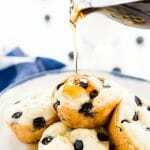 Combine the sugar and flour in a small bowl, mix thoroughly with a whisk. Cut the cold butter into small cube and add it to the flour/sugar mixture. Use a pastry blender or a fork to cut butter into the dry mixture until coarse crumbs form. Cover and refrigerate until ready to use. Line 11 cavities of a regular size muffin pan with paper liner. 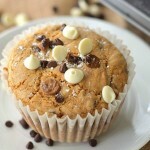 In a medium bowl, add whole wheat flour, baking soda, baking powder, salt and mix thoroughly with a whisk. Peel the bananas and mash them with a potato masher in another medium bowl. Add the light brown sugar, egg, yogurt, coconut oil and vanilla extract to the mashed banana and mix with a whisk until smooth. Pour the whole wheat flour mixture in with the liquid mixture and mix until just combined. Fold in 1 cup of blueberry. Divide batter equally into the previously prepared muffin pan. 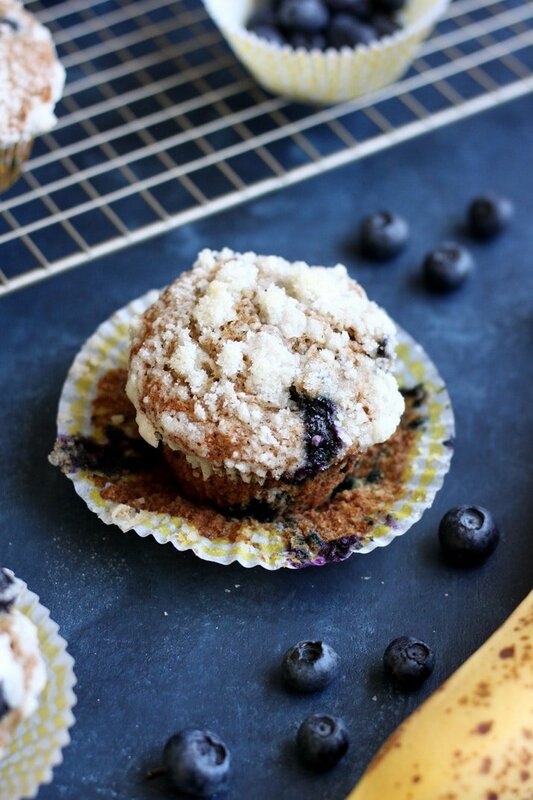 Top the batter with the rest of the blueberry, and sprinkle with 1 tablespoon of streusel. Bake for 20 minutes until a toothpick inserted in the middle comes out clean. Remove from oven and let cool on a wire rack for 5-10 minutes. 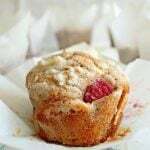 Flip muffins over to get them out of the muffin pan and onto a dish towel. Let them cool on their sides on the towel. Best served warm on the day they are baked. They can be kept at room temperature wrapped individually or in an airtight container for 1-2 days. Reheat in the microwave for 10-15 seconds when served the next day.